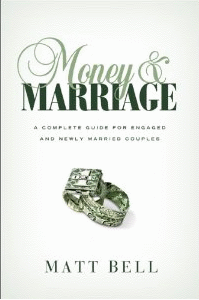 This week’s book review is for Money & Marriage by Matt Bell. After receiving a review I went ahead and read the book over a weekend. I want to share some of my thoughts on the book which I hope will help you decide if it’s right for you. In case you didn’t know, Matt blogs over at Matt About Money. If you’re read the book already, please share your thoughts in the comments. I love to hear from other readers and their perspectives on books I review. Even just looking at the content list, I noticed that Bell was trying to be as thorough as possible with some common pitfalls of newlyweds trying to figure out a financial system that reflects their values and their personalities. If you’re looking for more information, Matt includes some downloads of the charts and tables that are in the book at his site Matt About Money. If the two of you can sit down and discuss the book and work it out with the spreadsheets, it can be helpful. If you’re a fan of Dave Ramsey‘s incorporation of personal finances with some references to Scriptures, Bell’s book may appeal to you. He offers a lot of practical suggestions and covers a lot of ground in a relatively small book.